Click image to enlarge. See the listing here. 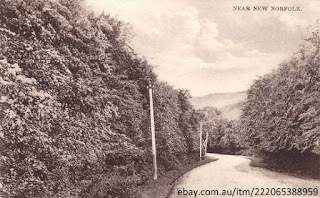 AN unusual postcard of a hedge-lined road is being offered for sale on eBay. Identified simply as "near New Norfolk", the postcard is being offered for sale for $10 including postage. Probably more than 100 years old, the rear of the postcard states it was printed in Saxony, one of the states of Germany. The eBay listing can be seen here. Do any readers have thoughts on where the picture on the postcard may have been taken? Dear Ed, this photo has been bugging me for a while because I have seen this site. Looking towards Lachlan just before Dr. Sweets driveway. Interesting thought, Ian. Glenora Rd at Plenty has been another suggestion. Initially my thoughts also but could not get the hills to align. My memory takes me back that all power poles many, many years ago on that road were made from railway tracks.